After hopping off the plane at Guanajuato International Airport (BJX), make your way to the posh, four-star accommodations of Radisson Poliforum Plaza Hotel Leon. Corporate travelers can attend shows and seminars at the Poliforum León convention center, only four minutes from the hotel, or treat clients to enchanting performances at the Teatro del Bicentenario, just seven minutes away. In town to attend a lavish wedding? Pick up memorable souvenirs from your trip at the Zona Piel or stroll hand-in-hand with your loved ones while window shopping along the vibrant Plaza Mayor. Make your work trip a memorable one when you book our Business Class Room. Enjoy extras like a complimentary breakfast each morning, a free drink voucher in the evening and a newspaper at your door each day. Dive into Mexico’s vibrant flavors at Restaurant La Guardesa, located on site at the Radisson. You can start your morning with a hearty breakfast buffet and later explore the extensive lunch and dinner menus, which feature Mexican favorites like Aztec soup. If you’re a health-conscious guest, ask our friendly staff about the low-fat menu to stay on track with your goals. You can enjoy a quiet meal in your room 24 hours a day when you order from our room service menu. Relax in your PJs while you savor a delicious breakfast in bed, or end your evening on a sweet note with a delectable dessert. When night falls, gather friends for refreshing cocktails and live music at the on-site Lobby Bar. You can challenge colleagues to a friendly game of billiards or enjoy relaxed conversation on the charming terrace. Parque Metropolitano de León – This 337-hectare park is home to a scenic lake and a variety of bird species, making it a popular spot for bird-watching. You can rent a bike, hop aboard the train or stroll leisurely on foot to explore the remainder of the park. Teatro del Bicentenario – Considered the Sydney Opera House of Guanajuato by locals, the Teatro del Bicentenario draws eager audiences for operas, ballets and orchestral concerts. Don’t miss this cultural gem located just seven minutes from the hotel. Estadio León – This celebrated stadium, home of the Club León soccer team, has notably hosted two World Cups. If you’re in town during the off-season, tour the stadium where you can get a glimpse of the on-site museum, trophy rooms and press room, all just a five-minute drive from the hotel. 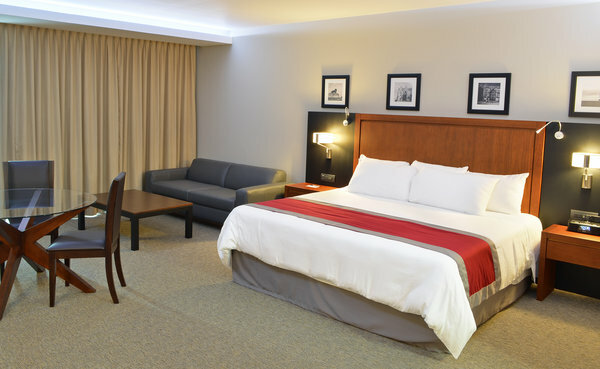 Whether you’re hosting a business seminar, a family reunion or an elegant wedding reception in León, the Radisson offers sizeable accommodations perfect for your affair. Our flexible event complex, Atrius, is home to nine meeting rooms that offer nearly six-meter-high ceilings and room for up to 1,400 guests. Ask our friendly staff about on-site catering services to ensure your event is a success. Boulevard Adolfo Lopez Mateos #2611 Ote.